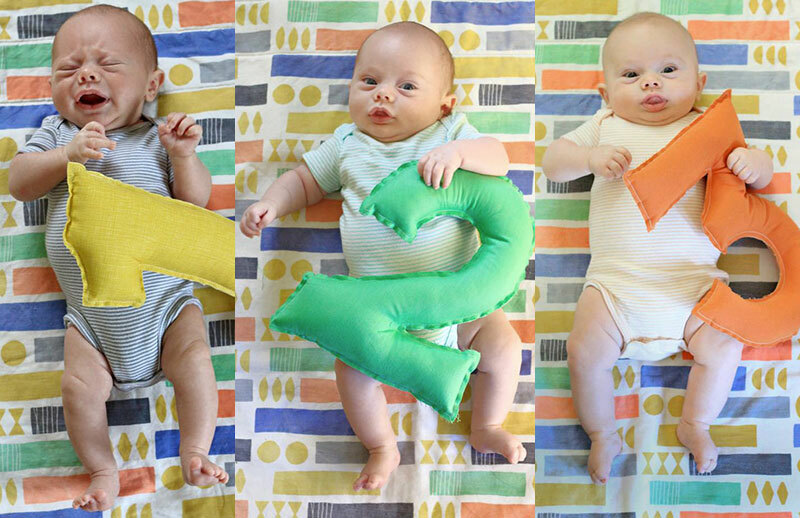 Of course you’re going to capture a gazillion photos during your baby’s first year. And like many proud parents, you may go the extra step of snapping a photo every month specifically to watch Baby grow. Monthly baby photos help you see the wonderful growth of your cherished little one over the first year. There are lots of apps and props available to make it super-simple to capture monthly milestones. But if you’re the DIY type, we’ve got some tips from Hallmark designer and new mom Katherina London to make it fun and easy. Do you want to show scale, so you can see how much Baby grows from month to month? If so, at least one major element needs to stay in the picture every month: It can be a blanket or rug, chair or pillow, toy or prop. Is there a story to tell? Use a prop with special meaning. For example: One mom we know took pictures with a combat helmet to send to her Army husband overseas. Are you crafty? Maybe you want to letter the month on a chalkboard, or stitch the number into a stuffed pillow (like Hallmark Art Director Cece Merkle did), or paint on an oversized block. 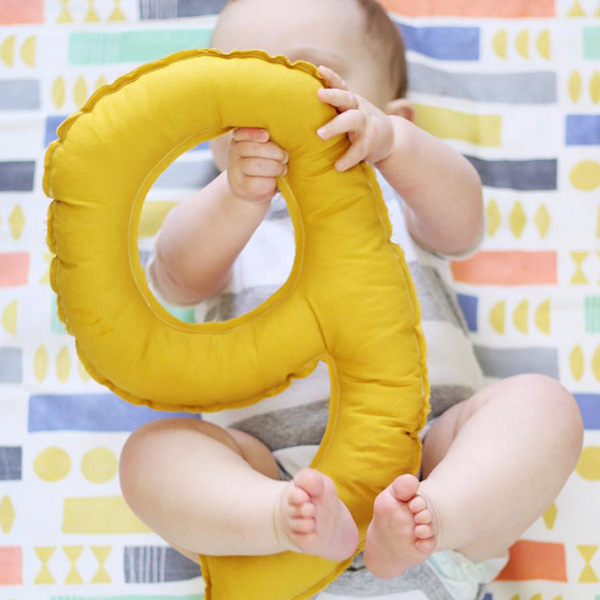 Or get simple onesies and paint the month or number on each one—which is also a great project for an older sibling! Are you REALLY crafty? You can draw, paint, design, or construct backdrops that change every month. Do you want to add monthly baby stats? If so, keep the background super-simple so you can add text over the photo. Where will you display the photo? If you’re going to Instagram these memories, stay square—but if they’re going in a more traditional photo frame, adjust accordingly. If you’re standing over the baby to take your photo, it can mess with your lighting. Set up next to a big window to get plenty of natural light, so you don’t have to use a flash. The older little ones get, the more wiggly they are. Using a camera with adjustable shutter speed is helpful to snap your kiddo’s quick body movements rather than getting a blurred arm or leg. Many camera phones also let you shoot “live” photos or multiples and choose the best still image. If you’re using a heavier camera or bigger phone, consider using a strap so you don’t accidentally boop the baby with it when you bend over. Avoid using tiny props or decorations Baby might be tempted to put in her mouth! If you can, get some help. Your partner, a friend, or grandma can help by making faces or noises while you take the pictures. Plus it’s great bonding time for all three of you. Compose your photo by looking at your backdrop through the viewfinder or at the phone screen before you add the baby. You might find that your props need to be closer together to fit in the shot. Or that your layout is too long for that perfect Instagrammable square. If your approach or backdrop is artsy—lettering, sewing, painting, etc.—make sure it’s something you really enjoy, so you don’t get bored or frustrated before the year is up. We’ve got more general tips from Hallmark’s photo studio on getting great baby pictures, taking adorable holiday photos…even dressing for family pics. Did you take month-by-month photos of your little one? We’d love to see them! Share them using @hallmarkstores.